Be it a staycation or a quick getaway with that special someone, finding a hotel that sets the perfect mood can make or break the romantic weekend. Beautiful views, roaring fireplaces, private beachside dinners or even just a plush king-size bed with 1000-thread count sheets (sometimes that’s all you need) can all inspire passion. Whether you want to go big for Valentine’s Day or just need a weekend escape filled with romance, these hotels are guaranteed to set the mood. The brand-new Kimpton hotel in this idealic Vermont town is the perfect winter escape. Many rooms come equipped with fireplaces, ideal for getting cozy after a day of skiing. With exceptional service, the dog-friendly hotel is ready to make your stay special with nightly, complimentary wine happy hours for guests, add-on amenities (in-room massage, anyone?) and amazing outdoor excursions, like driving Range Rovers through snowy obstacle courses. Ski during the day then dine at popular in-house restaurant The Copper Grouse, where executive chef Adam Raferty serves plump diver scallops drizzled with a Champagne butter sauce and tender filet mignon over whipped potatoes with a cabernet-thyme reduction. This new hotel is in the middle of all the action. The Grand Bohemian transforms classic southern hospitality with hip modern comfort, over-the-top art and bold colors. Downstairs in the wine room, take a private class in blending grapes, techniques and varietals led by the hotel’s sommeliers, then custom blend your very own wine with its own label to take home. Grab a cocktail at the rooftop bar decked out with fire pits and couches, ideal for snuggling, before heading out for dinner at FIG or Husk, which are both only a few blocks away. Tip: Try to get a room with a bathtub and fill it with bubbles while you sip with your partner. If you are going to go big, go to The Post Ranch Inn. 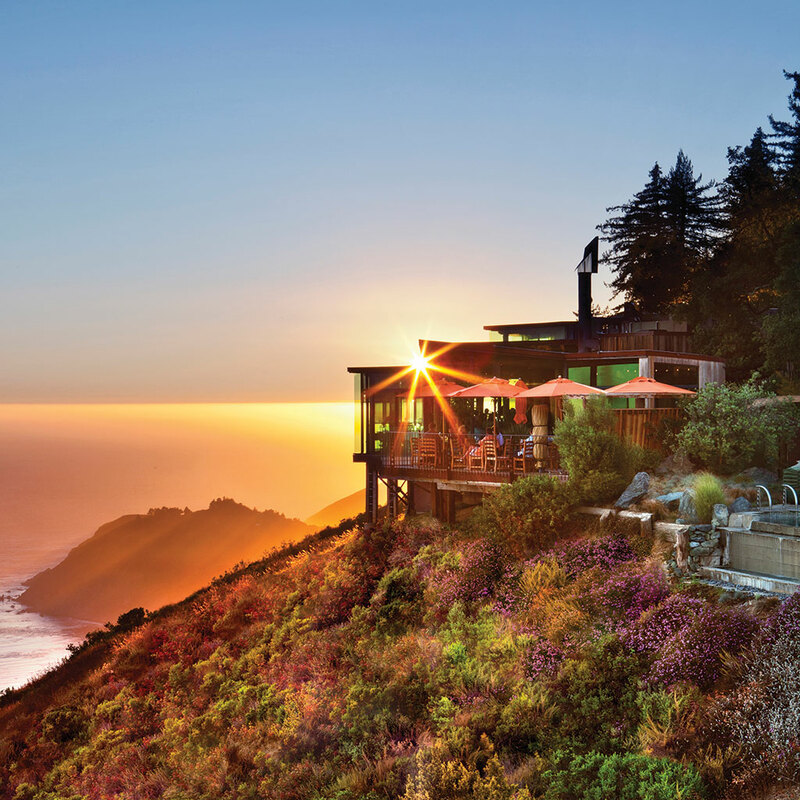 This über-romantic cliffside hotel in Big Sur will ensure your escape from the day to day is anything but ordinary. Offering yoga, horseback riding lessons, guided culinary tours and nature walks, staying at the Ranch is guaranteed to clear your head after only a night’s stay. The mission of the hotel is to wow and with their romance packages, they succeed. The grandest of them all is the Surf and Stay, a hotel and air package for three nights including flight (on Surf Air) with private transportation to and from the hotel, use of a Lexus throughout your stay, two dinners at the Sierra Mar Restaurant (one four-course and the other nine-course), Champagne, breakfast and all of their amenities. This Lower East Side hotel effortlessly mixes a peaceful oasis with chicness. From the 14th floor brick-walled lobby that screams NYC to the expansive rooftop patio with unobstructed 360-degree views of the city, the Hotel Indigo gives you a taste of true New York style. At night, the floor-to-ceiling windows in the rooms set the mood with the twinkling lights of the city. Knowing that the hotel offers a 2 p.m. check-out, take advantage of the Champagne included in the Romantic Escape package and sip cocktails at Mr. Purple, the hotel’s new bar, while you take in even more stunning views of the city. Sanibel Island is a jewel set in the crazy that is Florida at this time of year. Feeling almost like a secret escape, the island boasts stunning yet calm beaches, incredible seafood and a pace that inspires rest and relaxation. Sundial Beach Resort & Spa offers beachfront accommodations made for romantic dinners and sunset walks. You can add to the natural romantic setting by adding a bottle of Chandon served with strawberries and whipped cream to set the mood, or have a private dinner on the beach with a four-course meal and a bottle of wine from the Sundial’s vintners list.